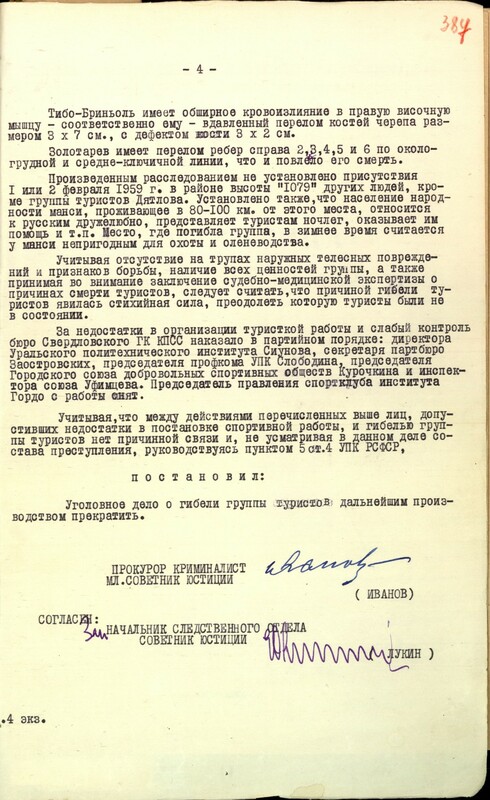 January 23, 1959 a group of amateur hikers in the amount of 10 people went on a ski trip along the route: city of Sverdlovsk - city of Ivdel - 2nd Northern district - Mt. Otorten - Oyko-Chakur mountain - North Toschemka river - Vizhay settlement - city of Ivdel - city of Sverdlovsk. The group consisted of: Igor Dyatlov - a student of the Ural Polytechnic Institute, leader of the expedition; Dubinina L.A., Kolmogorova Z.A., Kolevatov A.S., Yudin Y.E., Doroshenko Y.N. - UPI students; Zolotaryov A.A. - Instructor of the Kourovka Tour Base, Slobodin R.V., Krivonischenko Y.G., Thibeaux-Brignolle N.V. - engineers of enterprises in Sverdlovsk and Chelyabinsk. All the participants of the expedition had good hiking training and could participate in a trek of III category of difficulty. The group was supplied with the necessary equipment and food, the trade union committee of the Ural Polytechnic Institute financed the expedition. Arriving safely to the place of the beginning of the trek - the 2nd Northern Ivdels district on 28.I.59 the group started the hike. One hiker - Yudin Y.S. returned home from the site of the 2nd Northern, as he could not continue the trek due to illness. 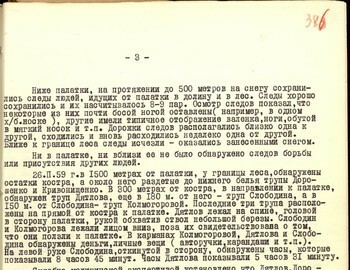 From diary entries, sketches of the route and developed photographic films of the hikers it is determined that on 28 May 1959 the group went upstream Lozva river, 30.I.59 the group continued its movement, 31.I.59 the hikers reached Auspiya river and tried to go over the pass to the valley of Lozva river, but because of the low temperature and strong wind they had to go back down and stopped for overnight. On I.II.59 hikers built a storage in the upper reaches of Auspiya river in which they left supplies of food and all unnecessary equipment. On 31.I.59 going back in the valley of Auspiya river and knowing about the difficult conditions of the relief of the height "1079", where the ascent was supposed to be, Dyatlov, as the leader of the group, made a gross mistake allowing the group to begin the ascent on 1.II.59, only at 15-00. Later, on the ski trail, which was preserved at the time of the search, it was possible to establish that the hikers, moving to the valley of the fourth tributary of the Lozva River, were 500-600 m to the left and instead of the pass formed by the peaks "1079" and "880" they went up on the eastern slope of height "1079". This was Dyatlov's second mistake. 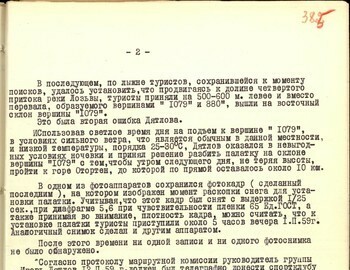 Using light day time to rise to the top of the "1079", in conditions of strong wind that is usual in this area, and a low temperature of the order of 25-30°C, Dyatlov group found themselves at unprofitable conditions for spending the night and decided to pitch the tent on a slope of height "1079" so that in the morning of the next day, without losing altitude, go to the Mt. Otorten, to which the distance in straight line remained about 10 km. In one of the cameras the last frame shows the moment of excavation of snow for the installation of the tent. Considering that this frame was shot with an exposure of I/25 seconds, with a diaphragm of 5.6 at a film sensitivity of 65 Un. GOST, and taking into account the density of the frame, we can assume that the hikers started the installation of the tent around 5 pm 1.II.59. A similar picture was taken with another camera. After this time, no records and no photos were found. According to the protocol of the route committee, the group leader, Igor Dyatlov, 12.II.59, was to telegraphically inform the sports club of the UPI and the Committee of Physical Education (comrade Ufimtsev) on arrival of the group in the village of Vizhay. 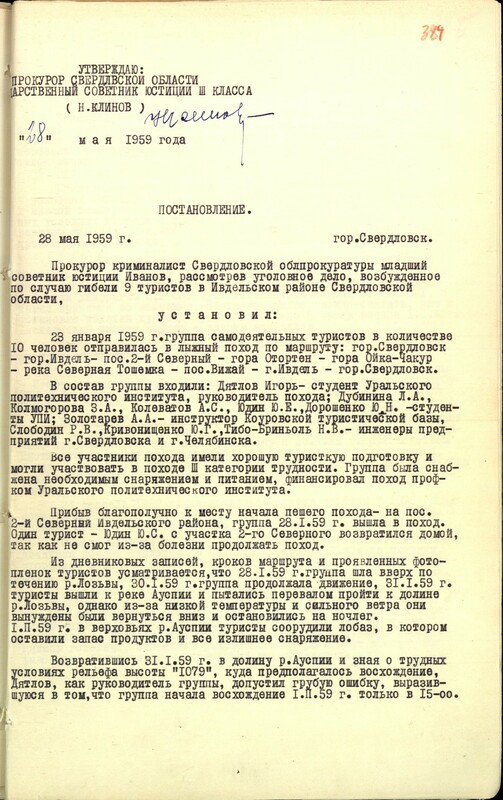 Since the deadline of 12.II.59 passed, and no information was received from the group, the hikers who knew Dyatlov closely demanded a search to start, and on 20.II.59 the Institute's leadership on the Dyatlov route sent a search team, and then several more groups. Subsequently, soldiers and officers of the Ministry of Internal Affairs, planes and helicopters of civil and military aviation joined the search operation. On February 26, 1959, on the eastern slope of the peak "1079" the group's tent was found with all the equipment and food in it. The tent and all that was in it were well preserved. Inspection of the tent showed that it was set correctly and provided accommodation for the hikers. In the tent there were 2 blankets, backpacks, storm jackets and trousers. The rest of the blankets were crumpled and frozen. On the blanket were found several loin pieces. Location and availability of items in the tent (almost all shoes, all outer clothing, personal belongings and diaries) indicated that the tent was abandoned suddenly by all hikers at the same time, and, as it was established in the subsequent forensic expertise, the lee side of the tent, where hikers usually laid their heads, it was cut from the inside in two places providing a free exit of the person through these cuts. Below the tent, for up to 500 meters in the snow, traces of people walking from the tent to the valley and into the forest have been preserved. The traces were well preserved and there were 8-9 pairs. Inspection of the tracks showed that some of them were almost barefoot (for example, in one cotton sock), others had a typical footprint of felt boots, legs covered in a soft sock, etc. Prints of tracks were located close to each other, converging and again separated one from another. Closer to the border of the forest, the footprints were covered with snow and disappeared. Neither traces of a struggle nor presence of other people were found in the tent or near it. 26.II.59 in 1500 meters from the tent, at the forest boundary, the remains of a fire are found, and near it were the bodies of Doroshenko and Krivonischenko, stripped to the underwear. At 300 meters from the makeshift fire, in the direction of the tent, was found the body of Dyatlov, 180 meters away from him - the body of Slobodin, and 150 meters from Slobodin - Kolmogorova body. The last three bodies were located on a straight line from the fire to the tent. Dyatlov lay on his backs, his head in the direction of the tent, his hands clasping the trunk of a small birch. Slobodin and Kolmogorov lay face down, their pose testified that they were crawling to the tent. Money and personal effects (pens, pencils, etc.) were found in the pockets of Kolmogorova, Dyatlov and Slobodin. On his left hand pointing outwards Slobodin was wearing a watch that stopped at 8:45. Dyatlov's watch showed 5:31. Forensic medical examination found that Dyatlov, Doroshenko, Krivonischenko and Kolmogorova died from exposure to low temperature (frozen), none of them had physical injuries, not counting minor scratches and abrasions. Slobodin had a crack in the skull 6 cm long, which had spread to 0.1 cm, but Slobodin died from freezing. 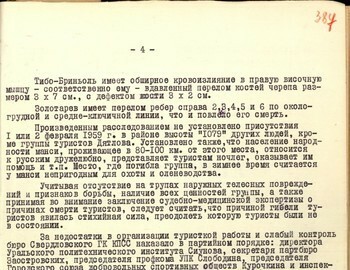 May 4, 1959, 75 meters from the campfire, in the direction of the valley of the fourth tributary of Lozva, i.e. perpendicular to the way of the hikers from the tent, under a layer of snow 4-4.5 meters, the bodies of Dubinina, Zolotaryov, Thibeaux-Brignolle and Kolevatov were found. On the bodies, as well as a few meters from them, Krivonischenko and Doroshenko's clothes were found - trousers, sweaters. All clothing has traces of smooth cuts, as already photographed with the bodies of Doroshenko and Krivonischenko. The dead Thibeaux Brignolle and Zolotaryov were found well-dressed, worse dressed Dubinina - her jacket made of artificial fur and a cap were found on Zolotaryov, Dubinina's naked leg was wrapped in Krivonischenko's woolen pants. Near the bodies, Krivonischenko's knife was found, which cut off the young firs near the fire. On the hand of Thibeaux-Brignolle were two watches - one of them shows 8:14, and the second - 8:39. Forensic evidence of bodies revealed that Kolevatov's death had come from the effect of low temperature (frozen), Kolevatov had no physical injuries. The death of Dubinina, Thibeaux-Brignolle and Zolotaryov was the result of multiple physical injuries. Dubinina has a semimetric fracture of the ribs: on the right 2, 3, 4, 5 and left 2, 3, 4, 5, 6, 7. In addition she has extensive hemorrhage in the heart. Thibeaux-Brignolle has an extensive hemorrhage in the right temporal muscle - corresponding to him - a crushed fracture of the skull bones measuring 3x7 cm, with a bone defect 3x2 cm. Zolotaryov has a broken ribs on the right 2, 3, 4, 5 and 6 along the parasternal and midaxillary lines, which caused his death. 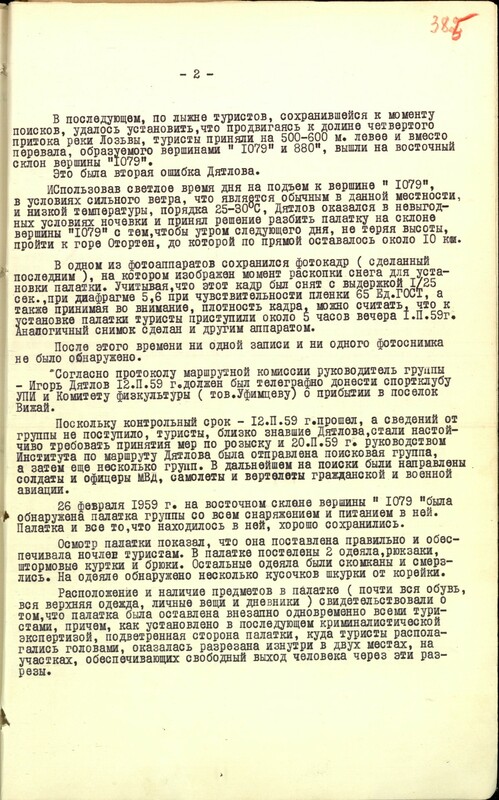 The investigation did not establish the presence of other people on February 1 or February 2, 1959 in the area of ​​the height "1079", except the hikers from Dyatlov group. It is also established that the population of the Mansi people, living in 80-100 km from this place, is Russian friendly, offers hikers accommodation, assistance etc. The place where the group died is considered to be unfit for hunting and reindeer breeding in the winter. 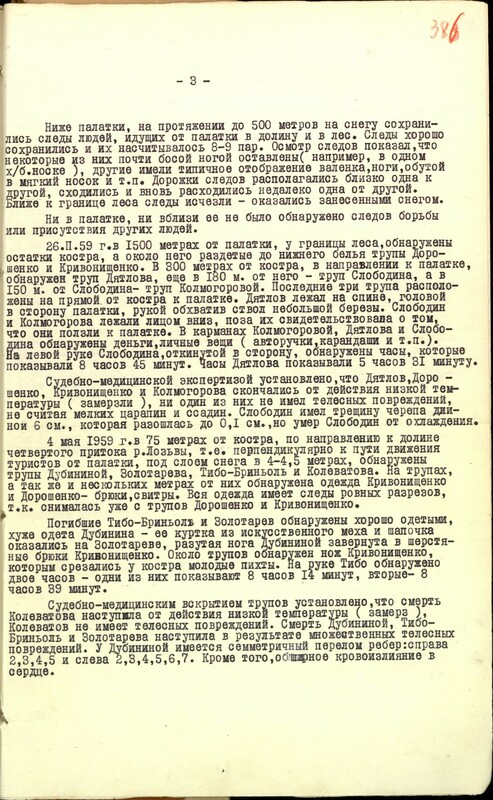 Considering the absence of external injuries to the bodies or signs of a fight, the presence of all the valuables of the group, and also taking into account the conclusion of the medical examinations for the causes of the deaths of the hikers, it is concluded that the cause of their demise was overwhelming force, which the hikers were not able to overcome. 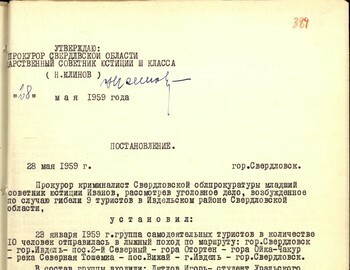 For the shortcomings in the organization of sports work and weak control of the bureau of the Sverdlovsk GC the CPSU punished in party terms: the director of the Ural Polytechnic Institute Siunov, the secretary of the party bureau Zaostrovsky, the chairman of the trade union UPK Slobodin, the chairman of the city union of voluntary sports societies Kurochkin and the inspector of the union Ufimtsev. The chairman of the board of the sports club of the Gordo Institute has been removed from work. The criminal case on the death of the group of hikers and further proceedings are to be terminated.